Is ‘Conservation’ trailing an elongating shadow as the sun sinks on common sense? If we consider this year’s ‘partially-failed‘ Lesser Flamingo breeding attempt & the subsequent rescue of abandoned chicks, en mass, it isn’t enough to leave well-alone. In 2006 a large, S-shaped island was built by Ekapa Mining on Kimberley’s Kamfers Dam. 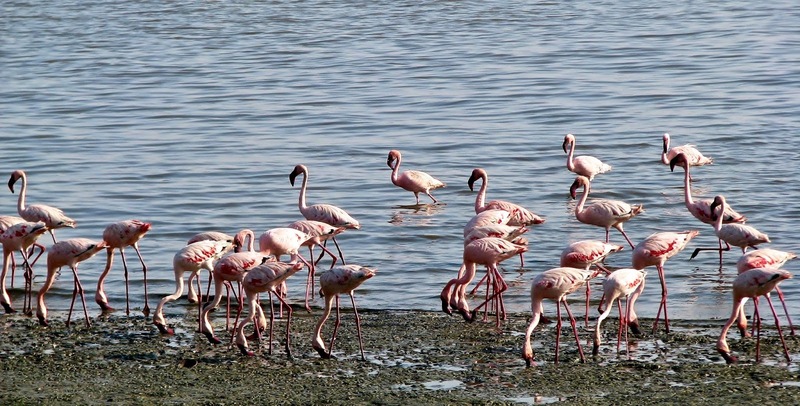 The island provided scalable habitat on which Lesser Flamingo could breed; and breed they have. Given their limited access to suitable sites elsewhere, the success of this artfully-contrived, anthropogenic shove-in-the-back, has been lauded, both here & abroad. Since then the island’s integrity isn’t what it was intended to be but the flamingos found a way. Those involved at the project’s incubation have been well-pleased. Subsequently, however, low water-levels have tested this year’s pink parade & large areas of Kamfers Dam have become a chapped, brittle shadow of its champagne-filled past. Like the human protagonists in this unfortunate saga – the flamingos rocked-on with as much foresight as the professional assets in boardrooms and behind the lectern at the press-shoot. Reliant on favourable water conditions to feed their young, unfavourable conditions have precipitated the abandonment of many newly-hatched chicks in, what is becoming, a more than sobering hang-over. Some chicks have perished – others have not & are doing well – many more have been rescued. To their credit, Ekapa stepped into the vacuum when the who-dunnits buried their heads in the ever-widening cracks. At the 11th-hour the mine part-financed a national rescue of the abandoned chicks. Their efforts and the co-ordinated efforts of hundreds more, from around the country & from all walks of life, are a commendable legacy. Those involved at the project’s incubation have been well-pleased. In addition to the area’s limited rainfall, Kamfers gets its water from Kimberley’s storm-water run-off and from par-treated effluent. Like most everywhere else, however, ageing infrastructure and official ineptitude has equated to leaking pipes – broken pumps & poop in the fields etc. As a result, the flow of grey water into the dam hasn’t met forecast, far from it & the magic conjured in 2006 proved to be fickle trickery in 2019. Written into the original farce is a municipal clause guaranteeing Ekapa Mining first bite of the effluent apple – most of the apple really, but mining is, what it is – a profit-driven enterprise. That said, & to Ekapa’s credit once more, the operation has reduced water consumption & remains viable – their intentions not important here. Unfortunately, the effluent apple has been significantly smaller than originally anticipated for a plethora of smelly reasons – a laissez faire attitude at the municipality, cited widely [wildly] in the press, the target of many fingers but no more lazy to be fair than the other bird-brains blinded by ‘thank goodness for me‘. As darkness descended on the dying birds – their reality was reduced to the intimate circle of light cast by social media. Fortunately, Africa has many gifts. Interventions are now, more than ever before, core to conserving viable wildlife populations – & particularly in this case – one of only four or five suitable breeding sites. It isn’t enough to live the early successes & publicly trivialise the unintended, negative consequences of an initiative that was, arguably, less than well-balanced in the first place, given the variables at play. Where water-scarcity and services in this country are exigent issues, what exactly is the plan when the music slows / stops? We could let ‘nature take its course, of course‘… but that would be cruel. When the stakes are this high, partial investment in long-term security highlights the risks inherent in the project. Some introspection and a renewed respect for the mitigation of risk, à la the Precautionary Principle, is warranted. Until then, we need to see the humanity in each of us and appreciate that we are all cogs in a well-developed intelligence network; like-minded people working for the common good – at least we should be.